Whether you like the cold or prefer the tropics, Zhang Zixuan offers you four different ways of celebrating the coming Spring Festival. There are a thousand ways to celebrate Spring Festival or Lunar New Year because of the vastness of the country. We track from north to south and from east to west to give you four different ways. Harbin in Northeast China offers you the coldest ice sculptures and frozen pears with the hottest yangko dance and dumplings. Sanya in South China brings the warmest tropical wind and bluest ocean. 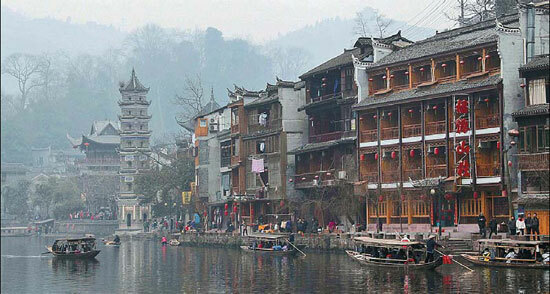 In Hunan’s Fenghuang ancient town, the starlight-like river lanterns lead you into the most poetic scene. At Shanxi’s Qikou township, the roaring Yellow River, accompanied by the cracking of ice, thrills you with the best of nature. 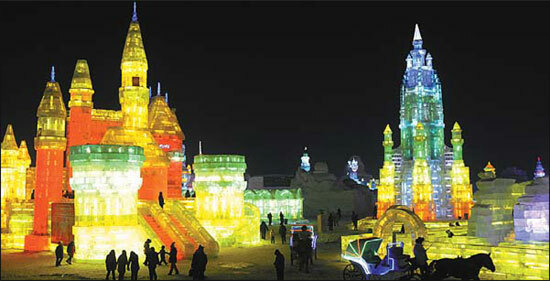 Dubbed "Paris of the Orient", Harbin carries the post-Christmas joy right up to Lunar New Year. The provincial capital of Heilongjiang province in Northeast China still maintains some traces of Western lifestyle and more than 200 fine examples of Russian architecture in town. But come Spring Festival, the city blends Eastern and Western elements to perfection. The highlight is the annual Harbin Ice and Snow Festival, bringing with it ice sculptures, on-ice performances and entertainment galore. From Lunar New Year’s eve right up to the 15th day of the first month in lunar calendar, every family has a red lantern in their home. Locals and visitors are treated to the yangko dance, a form of folk dance popular in northern China. The dance is so contagious that tourists are not expected to remain observers for long, but to join the dancers and have a good time. Like most Chinese, local Harbin residents pay special attention to family reunion dinner on the eve of Lunar New Year. The meal must include the "big four" – chicken, fish, ribs and pork leg. If any of the "big four" is missing, it is not considered a reunion dinner with Northeast flavor. And of course, dumpling is the most important food on the dinner table. The filling can range from sauerkraut to pork, shallot and lamb, and tomato and egg. Making dumplings with family members is the best bonding activity, and the fastest way for new friends to warm up. Some families will also put a few coins into some of the dumplings. There is a belief that those who chance upon the "fortune dumplings" will be blessed with good luck throughout the coming year. After a sumptuous dinner, sink your teeth into a frozen pear – a genius creation that can only be inspired by a temperature of -30 C.
With a name that means "phoenix", you can be assured of a remarkable Spring Festival celebration in this ancient small town in western Hunan province. The locals keep to the traditional way of celebrating the Lunar New Year. Before reunion dinner, they will have a ceremony to worship their ancestors and after dinner, the older generations in the family will distribute hongbao or red envelops with money to children. And everyone stays up until the wee hours of the morning to usher in the New Year. Fenghuang cuisine is mainly hot and sour, which makes you perspire as you savor the dishes. The names of the dishes, such as potted mushrooms and sour soup tofu, are enough to make you salivate. Customs like making sausages and sweet wine, and shopping on the New Year Miao ethnic market remain very much alive. The most interesting tradition is to float the river lantern. People gather on the Tuojiang River, put the paper-made lanterns on the water surface, light the candles and let the river takes the lanterns and the wishes of the people to wherever it flows. At midnight of New Year’s eve, the local government will let off large-scale fireworks, which last for 40 minutes and are really a feast for the eyes. From the first day to the 15th day of the Lunar New Year, there are also all kinds of performances and galas from various organizations and villages on Phoenix Congwen Square. The Qikou township is a remote town along the Yellow River in Shanxi’s Linxian county. Its location at the boundary of Shanxi and Shaanxi provinces gives it the rich culture and characteristics of both the places. At Qikou, you can watch the ice floating along the Yellow River during the Spring Festival. The Yellow River looks like a huge snake that is casting off its skin. The ice cracks and rumbles like a rock concert on the river. You can hide in one corner and daydream, or you can sit on heated adobe bed and learn to make cloth tiger and paper-cut decorations from local villagers.